This episode is devoted to the power that meditation can hold in helping us to better understand ourselves. My guest, Dr. Mani Sarathy, the Associate Director of the Clean Combustion Research Center at King Abdullah University of Science of Technology, shares his meditative journey with us and how it has helped to transform his life over the past 15 years. We dive into the nuts and bolts of what mediation means and specific strategies that we can all apply in our lives if we devote ourselves to this cause. Mani shares his backstory and the experiences that guided his formative years while growing up, in particular his self identity which was shaped by both Canadian and Indian cultural values. Mani has great insight and wisdom when it comes to meditation. Whether you are a total beginner or seasoned veteran at meditation, you are sure to glean some insight that can apply to both your personal and professional self. 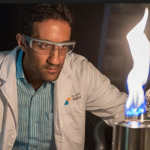 Mani Sarathy is an Associate Professor of Chemical Engineering at King Abdullah University of Science and Technology of Science and Technology (KAUST) in the Clean Combustion Research Center (CCRC). Mani was previously a Postdoctoral Researcher in the Combustion Chemistry group at the US Department of Energy Lawrence Livermore National Laboratory. During that time he held a prestigious fellowship from NSERC of Canada. Mani received his PhD and MASc degrees in Environmental and Chemical Engineering at the University of Toronto and his BASc in Environmental Engineering Chemical Specialization from the University of Waterloo. In 2015, Mani Sarathy was named a Thomson Reuters Highly Cited Researcher. Mani’s research interest is in developing sustainable energy technologies with decreased net environmental impact. A major thrust of research is simulating the combustion chemistry of transportation fuels. The goal of Mani’s research is study conventional and alternative fuels (e.g., biofuels, synthetic fuels, etc. ), so the environmental impact of combustion systems can be reduced.